Yang Kaihui with her children. Yáng Kāihuì (simplified Chinese: 杨开慧; traditional Chinese: 楊開慧; courtesy name: Yúnjǐn (simplified Chinese: 云锦; traditional Chinese: 雲錦); November 6, 1901 – November 14, 1930) was the second wife of Mao Zedong, whom he married in 1920. She had three children with Mao Zedong: Mao Anying, Mao Anqing, and Mao Anlong. Her father was Yang Changji, the head of the Hunan First Normal School and one of Mao’s favorite teachers. Yang Kaihui was born in the small village of Bancang in Changsha, Hunan Province, on November 6, 1901. Her name meant "Opening Wisdom", although she came to be nicknamed Xia, meaning "Little Dawn." Her father was Yang Changji, a teacher and leftist intellectual, while her mother was Yang Zhenxi, while she had a brother three years older than her, Yang Kaizhi. Through his teaching of ethics at the First Normal School of Changsha, Changji had become a father figure to a pupil named Mao Zedong, later writing in his journal that "it is truly difficult to imagine someone so intelligent and handsome" as him. A friendship developing, in summer 1916, Mao was invited to spend several days at Yang's Bancang home, walking twenty miles in straw sandals in order to get there. On this occasion, he did not talk to either Zhenxi or Kaizhi, instead bowing his head to them as a mark of respect. Yang Changji gained a professorship at Peking University and had moved his family to the city when Mao came to Peking in September 1918 with several like-minded friends from Hunan. Upon arrival, they stayed in the Yangs' small house in the north of the city. Here, Mao met Kaihui again, and the two discovered a mutual attraction. A friend who knew Kaihui at the time described her as "small in stature and round-faced, with deep-set eyes and pale white skin", and her appearance impressed both Mao and his friends. Kaihui later related that she had "fallen madly in love with him already when I heard about his numerous accomplishments" but did not make her feelings immediately known. She kept "hoping and dreaming" that he shared her feelings and decided that she would never marry anyone but him. Their relationship did not develop swiftly, as Mao was shy and lacked sufficient funds to court her, living in cramped rented accommodation with other Hunanese students in Peking's Three-Eyed Well district. Changji secured Mao a job at the university library as assistant to the librarian Li Dazhao, an early Chinese communist. In January 1920, Yang Changji died. Mao was in Peking ostensibly on business, though biographer Stuart Schram suspected his presence was partly due to his desire to comfort Kaihui. Yang Kaihui and her mother returned to Changsha with her father's remains, and she soon entered the Fusiang Girls’ School. At the missionary school, her exposure to revolutionary ideas going her labeled a 'rebel', who refused to pray and cut her hair short in defiance of convention. Mao had gone from Peking to Shanghai, where he worked in a laundry and joined a Communist group for the first time. Following the overthrow of Hunanese warlord Zhang Jingyao by generals favourable to Mao, he returned to Changsha in July 1920. Mao opened a bookstore and publishing house was appointed director of the primary school attached to the First Normal School. Now possessing social status and financial security, Mao was able to marry Kaihui. Yang joined the Chinese Socialism Youth League in the second half of 1920 as one of the first members in Hunan. She married Mao Zedong that winter, without any wedding ceremony or other celebrations. Yang joined the Communist Party of China (CPC) in the beginning of 1922. In April 1923, Mao went to the CPC's Central Committee in Shanghai to work as the Organization Department Minister. In the following year, Yang Kaihui, together with her two children, Mao Anying and Mao Anqing, joined her husband in Shanghai and organized an evening school at a cotton mill. In 1925, accompanied by Mao, Yang Kaihui went to Shaoshan to organize peasant movements, while caring for her husband and educating their children. At the same time, she continued to teach peasant evening schools and contracted with other comrades. In the beginning of 1927, Mao inspected the peasant movement in Hunan. Yang Kaihui sorted through the large amount of investigation materials and neatly copied them down. Mao’s report on the peasant movement in Hunan, including Yang's contributions, was published in March of that year. During this period Yang organized many movements among peasants, labor, women, and students. In October 1930, the local KMT warlord He Jian captured Yang Kaihui and her son Mao Anying. Her captors wanted her to publicly renounce Mao Zedong and the CPC, but she refused to do so. Even under torture, she is reputed to have told her captors that "You could kill me as you like, you would never get anything from my mouth", "Chopping off the head is like the passing of wind, death could frighten cowards, rather than our Communists", "Even if the seas run dry and the rocks crumble, I would never break off relations with Mao Zedong", and "I prefer to die for the success of Mao's revolution career". 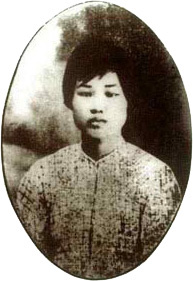 Yang was executed in Changsha on November 14, 1930 at the age of 29. Her children with Mao Zedong were effectively orphaned, and were rediscovered years later. Mao Anying later died early in the Korean War, and Mao Anqing became a translator for the Central Committee of the Communist Party of China. Poplar and willow soar lightly to the heaven of heavens. Presents them respectfully with cassia wine. To dance for these faithful souls in the endless sky. And they break into tears of torrential rain. I lost my proud poplar and you your willow. and ask the prisoner of the moon, Wu Gang, what is there. Tears fly down from a great upturned bowl of rain. The allusion to poplar trees is a reference to Yang, whose surname meant "poplar", while that to willows alludes to Liu's surname, which meant "willow". Tiān yīn qǐ sù fēng, nóng hán rù jī gǔ. Niàn zī yuǎn xíng rén, píng bō tú qǐfú. Zú jí kě fǒu quán? Hán yī shì fǒu bèi? Gū mián shuí ài hù, shì fǒu yì qī kǔ? Shū xìn bù kě tōng, yù wèn wú rén yǔ. Hèn wú shuāng fēi hé, fēi qù jiàn zī rén. Zī rén bùdé jiàn, wǎng chàng wú yǐ shí. It is cloudy and very windy; the severe coldness invades my body. Miss you in the long distance; my feeling goes up and down suddenly. Is the illness on your feet cured? Are clothes defending against coldness enough? Sleep alone without any cares and loves; maybe I am also arduous and have tasted too many hardships. No letters could reach to you and nobody could be asked. Regret that I have no wings, or I could fly to you. Couldn’t see you, the time that I take companion with sadness and depression would never come to an end. Portrayed by Zhou Dongyu in the movie The Road Of Exploring. Portrayed by Li Qin in the movieThe Founding of a Party and on the TV series China in 1921. Portrayed by Zhang Meng on the TV series Epoch-Making. Portrayed by Li Qin in the movie The Founding of an Army. Portrayed by Sarah Zhao on the TV series Autumn Harvest Uprising. ^ a b c d e f Pantsov & Levine 2012, p. 56. ^ Feigon 2002, p. 21. ^ Feigon 2002, p. 18. ^ Pantsov & Levine 2012, p. 39. ^ Tang, Zongli; Zuo, Bing (1996). Maoism and Chinese Culture. Nova Science Publishers. ISBN 9781560723530. ^ Terrill, Ross (2015-05-12). The Life of Mao. New Word City. ISBN 9781612308692. ^ a b Schram 1966, p. 48. ^ a b Pantsov & Levine 2012, pp. 56–57. ^ a b Feigon 2002, p. 27. ^ Pantsov & Levine 2012, p. 57. ^ a b Davin, Delia (2013-04-25). Mao: A Very Short Introduction. OUP Oxford. ISBN 9780191654039. ^ Schram 1966, p. 56. ^ a b Street, Nancy Lynch (2004). In Search of Red Buddha: Higher Education in China After Mao Zedong, 1985-1990. IDEA. ISBN 9781932716030. ^ a b c Stewart, Whitney (2005-12-15). Mao Zedong. Twenty-First Century Books. ISBN 9780822527978. ^ Schram 1966, p. 57. ^ a b c Zhi-Sui, Li (2011-06-22). The Private Life of Chairman Mao. Random House Publishing Group. ISBN 9780307791399. ^ "1930: Yang Kaihui, Mao Zedong's wife". ExecutedToday.com. 2012-11-14. Retrieved 2018-07-29. ^ Feigon 2002, p. 51. ^ Schram 1966, p. 208. ^ Schram 1966, pp. 208, 352. ^ a b Schram 1966, p. 352. This page was last edited on 12 August 2018, at 11:28 (UTC).